We had bought all our furniture before we had kids, so in our old house I felt like we were able to keep it slightly adult looking even with a baby swing in the middle of the living room. We moved right before baby #2 arrived and set everything up to be child friendly for our toddler and new baby, including disassembling our dining room table and storing it along with the extra chairs. Now where a dining room table would be is an explosion of children’s toys that my husband and I try to clean up each night to pretend for an hour or two that we live in a tidy house. Our original living room furniture doesn’t quite mesh with the toy storage system that we have implemented with shelving from my toddler’s bedroom. More on that later. Slowly and surely, the toy invasion has moved upstairs into our bedroom and bathroom. I’ve tripped on several toy cars or stuffed animals in the middle of the night, so I have implemented a cheap system of throwing toys in an empty diaper box at the end of our bed. We have recently started the task of Spring Cleaning the house from top to bottom. This has given me a surge of newness and a drive to make our bedroom an adult oasis. I started toying with different color schemes. How do I want to feel when I’m in our room? In the first option I use bright colors that reflect our personalities. Warm, fun, very outgoing. I love it, my only problem is that it feel very kid friendly to me. 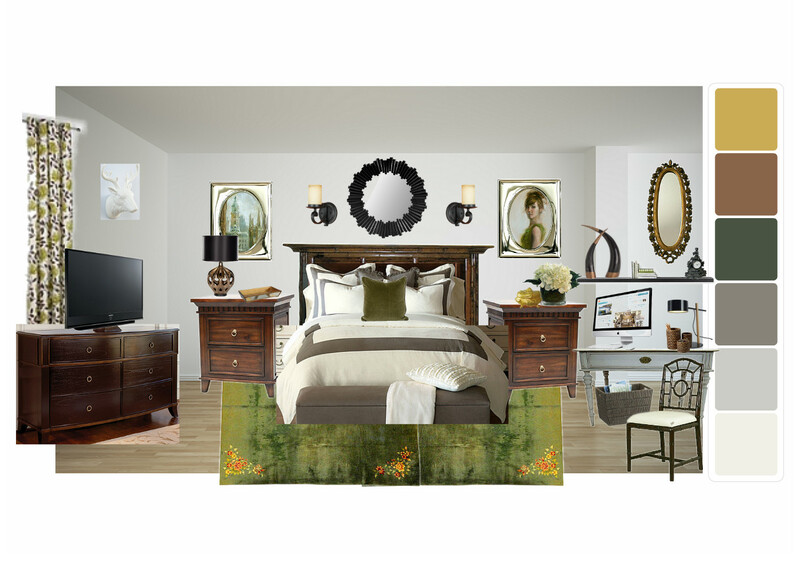 In this option I wanted to use a warm green to go with the wood color of our existing furniture. 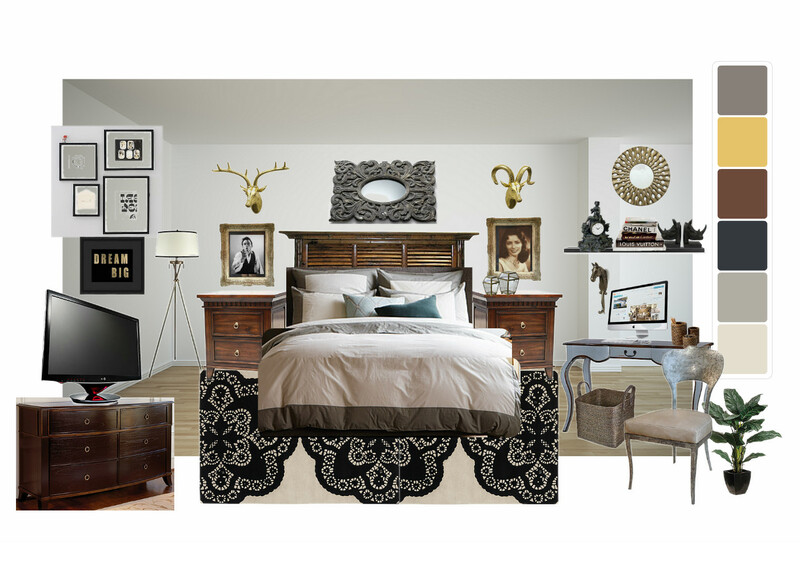 I do not want to replace our existing bed, nightstands and dresser, so those will remain the same in each option. I do want to add a garage sale/ flea market desk and paint it a complimentary color to the scheme. I typically don’t use green with my house decor but it looks like lovely with the wood and I am trying to create something different from the rest of the house. 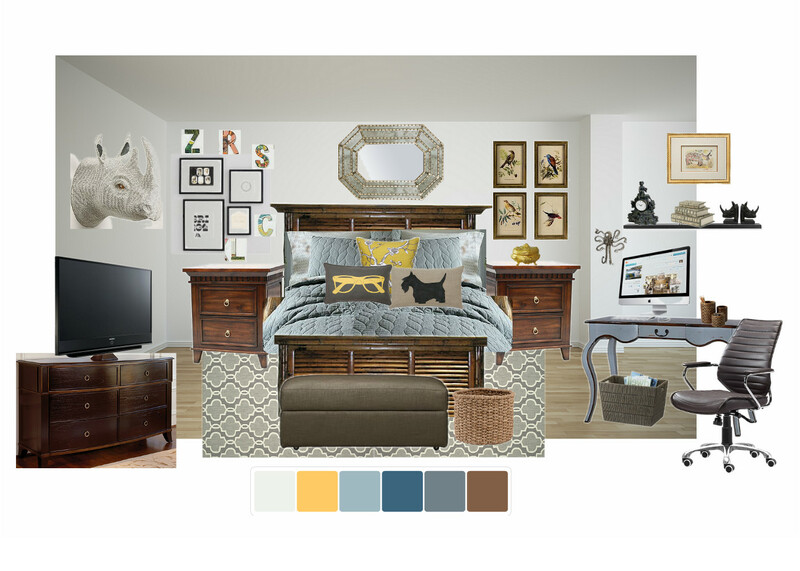 And finally, the most adult and chic and glamorous scheme I could come up with. Since we’re currently renting our house I wanted to avoid painting the walls. I’ve been seeing lots of white and black bedrooms that I just thought were the cats pajamas. See below. This was hands down my favorite. To mimic the old photographs I found some images of Johnny Cash and June Carter Cash to put in some ornate gold frames (we are big Johnny Cash fans, even named our first son after him). I wanted everything black and white/cream and gold. Very simple and clean and no kiddish colors found in the rest of our house. 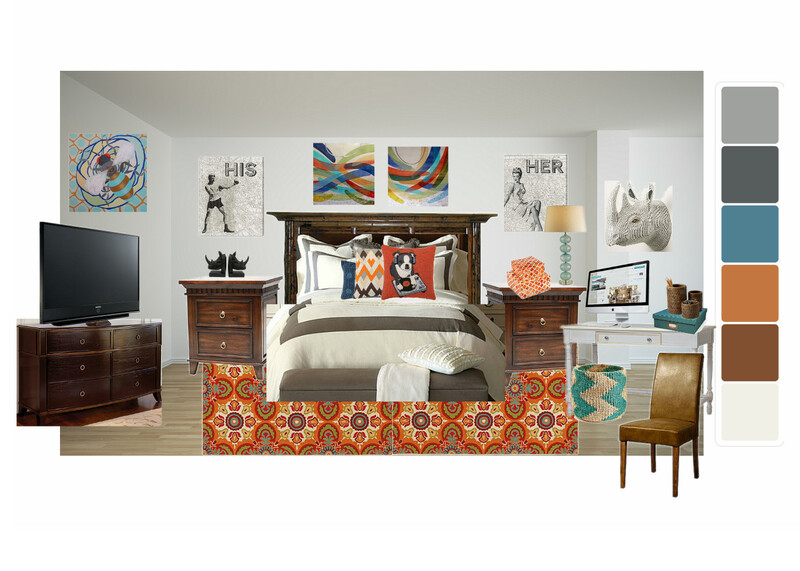 So let me know what you think of my bedroom options! Or give me suggestions for more adult themed schemes! 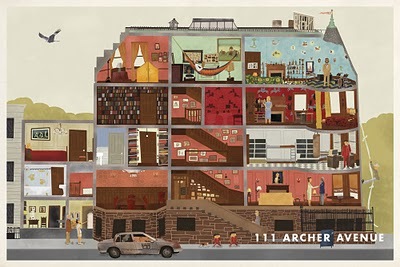 The main thing I’ve noticed in Wes Anderson interiors is Collections. Every character or room has a collection of some sort. Hand drawings, books, computer equipment, taxidermy, and even color. Each room is ultra rich and saturated with a focus. I love Margot’s room of family portraits personally. My advice to give your room a simple nod to the legendary director Wes Anderson, find something that tickles your funny bone and make a little collection of it. Large scale collections might be a little cumbersome, so minimize it for an even more amusing collection. My next collection is going to be “Z”s for my last name. I think the fun part will be finding them amongst the adventures of life. I also want a little corner of antlers and animal busts. To get my giggles, I’m going to look for them in fun colors or paint them myself. I saw a recent post on younghouselove.com where the took plain white antlers and dipped the tips in bright colored paint. 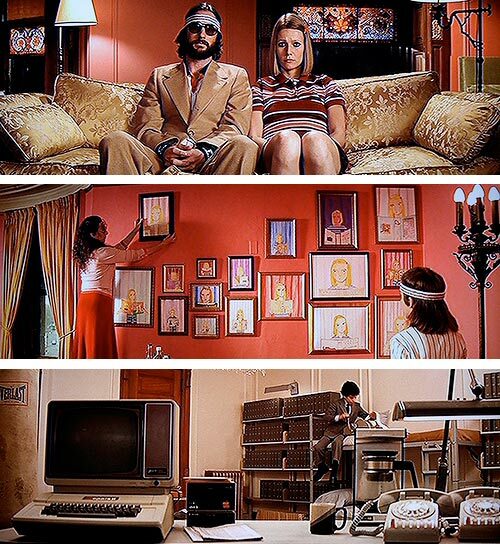 Now when I said that one of the collections in a Wes Anderson room was color, I meant just that. It’s red walls, with rich red velvet chairs, a red piano, a mom in a red skirt, red area rugs, etc. In this make believe world, it works. I’m not as big of a fan of it in the day to day world. I want a little bit of mix up in my colors and patterns. Just a personal preference. I am and will always be a fan of Wes Anderson and how his sets, costumes, and cinematography makes me feel. Sometimes a problem you think you have really isn’t that catastrophic. And when you look back at it in the future, will your reaction be as amusing as a Wes Anderson characters’? Hope you had a good read. Until next time!